Most lodging establishments exist for one sole purpose – to put heads in beds. Granted a good number of properties support local charities, and as a whole they generally improve the community with an influx of tourism dollars; however these altruistic efforts are not the main reasons for their existence. Of course there are exceptions to every rule, and gladly the Sonoran Desert Inn and Conference Center (www.sonorancc.com) rises above the crowd in this regard. 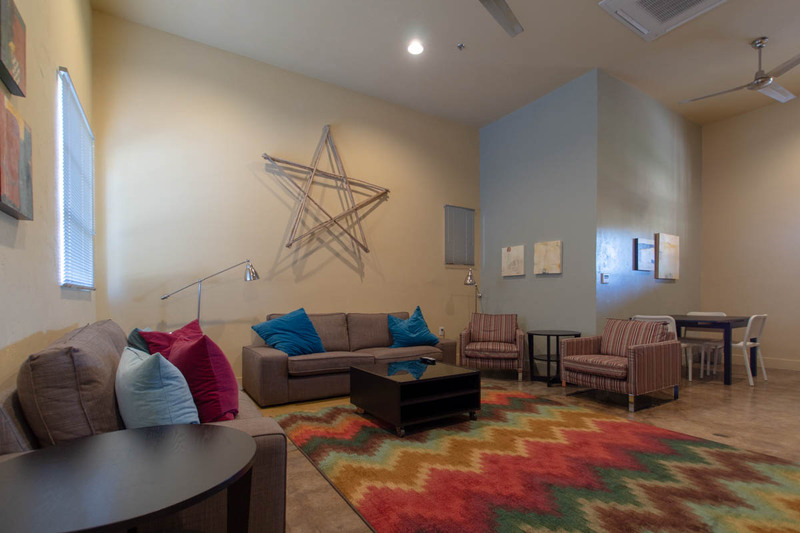 Not only does this Southern Arizona inn offer comfortable accommodations at affordable rates, but it also serves the community on an ongoing basis with job training, internship programs and opportunities for local artists. 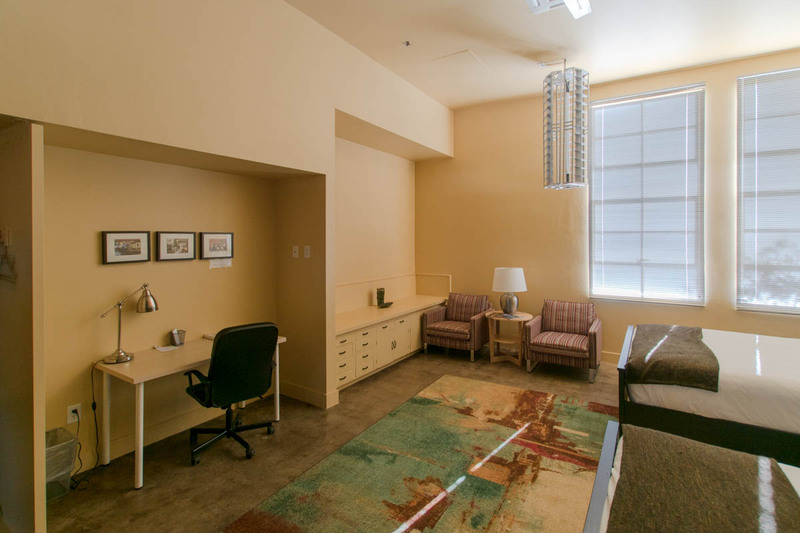 Add in some nicely designed wheelchair-accessible rooms, and you have the perfect place for an Arizona desert getaway. Located about two hours southwest of Phoenix, in the middle of the Sonoran Desert, this 21-room inn has an interesting backstory. 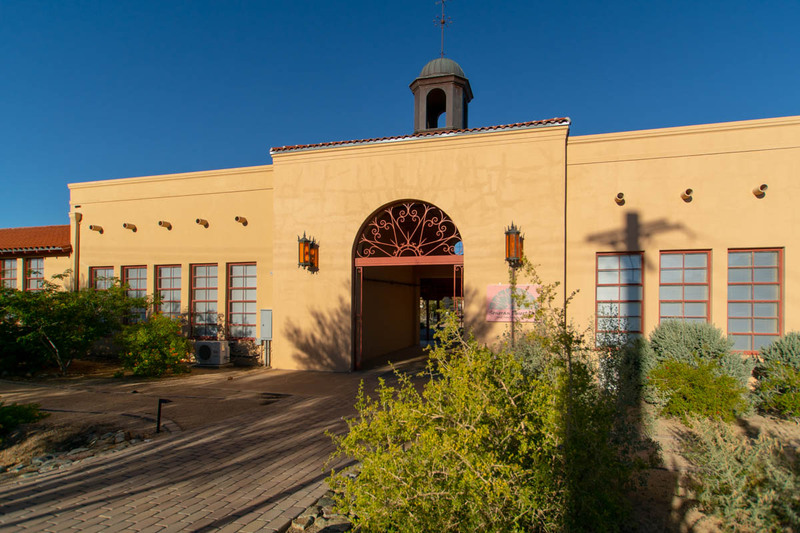 It begins with the International Sonoran Desert Alliance (ISDA), a non-profit that purchased the deserted Curley School Campus in 2010 and proceeded to covert two wings into the Curley School Artisan Apartments. The purpose of the project was twofold; to serve as a job training site for the ISDA apprentice program, and to attract artists in residence to revitalize the once thriving copper mining town. It was a success on both levels, and the first phase of the project put Ajo on the map as a center for creativity and artistic endeavors. The second phase of the project began in 2011, with the conversion of the third wing of the former school into a lodging and conference facility. Designed by Rob Paulus, the new incarnation incorporates the original features of the school into what the architect dubs a “Southwest Industrial” design. And of course the rooms are filled with touches from local artists, such as ceramic room-number tiles and even javelina pillows. Top it off with several large public areas and an expansive courtyard, and you have a property that’s suitable for both individuals and groups. 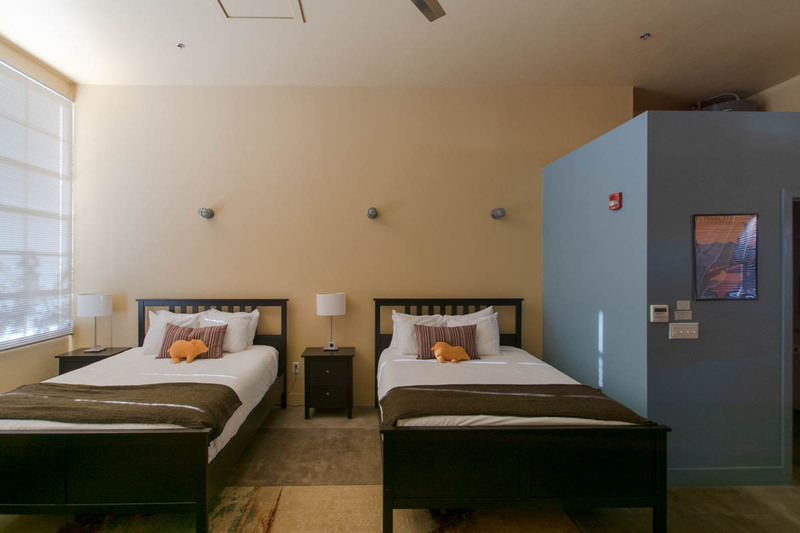 Inclusion was not overlooked in the design of the inn either; as it boasts four accessible rooms – including two with roll-in showers – which is well over the required minimum. There’s plenty of space to parallel park an adapted vehicle in the large dirt parking lot in front of the inn, with curb-cut access up to the walkway over to the office. 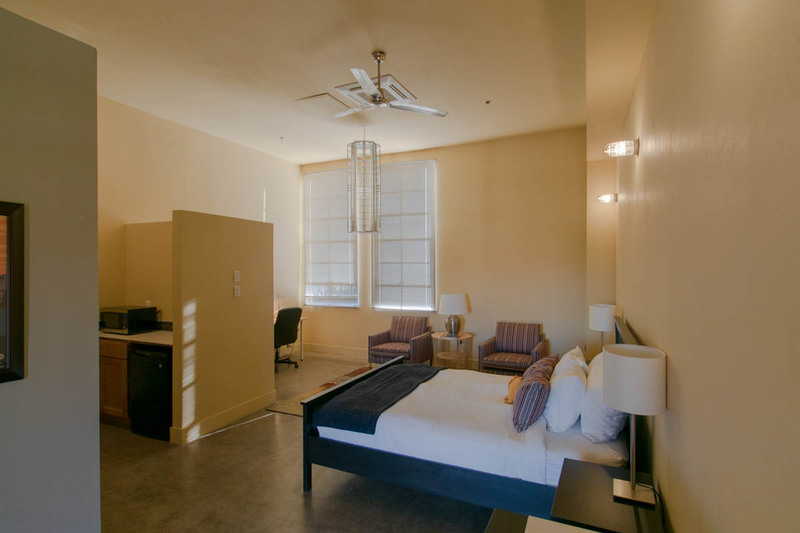 Additionally, all of the accessible rooms are located close to the parking area. 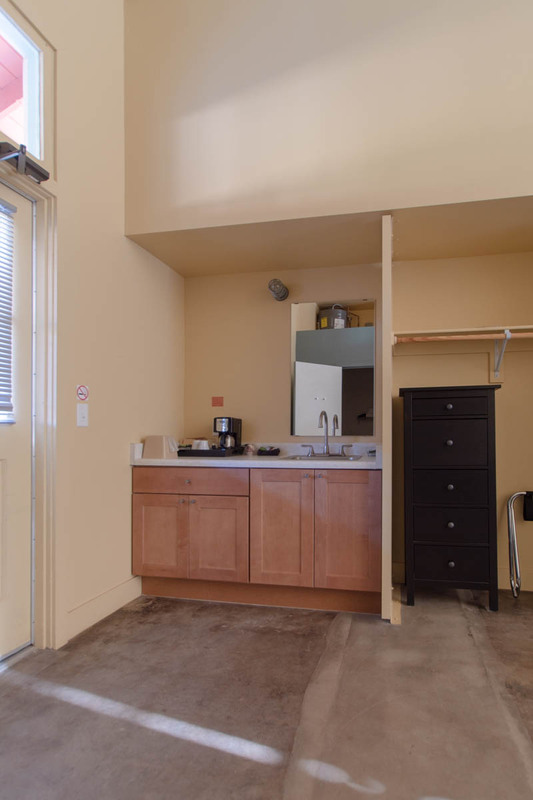 The accessible rooms are quite spacious, with excellent pathway access and easy rolling on the stained concrete floors. Warm tones highlight the walls, and some of the old classrooms features – like paper cabinets and built-in drawers – were incorporated into the overall design. Each room features pieces by local artists and hand-crafted furniture, and they all get top marks for wheelchair access. Room 1111 is furnished with a 22-inch high open-frame queen-sized bed, with wheelchair access on both sides, a desk with a chair, a chest of drawers and two easy chairs. 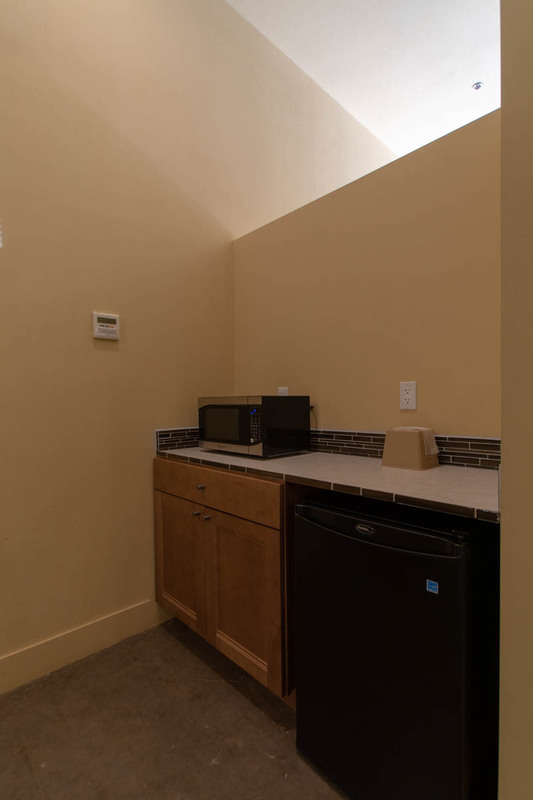 It also includes a small kitchen nook with a sink, a refrigerator, a microwave, and a few plates and glasses. And even with all that furniture, there’s still plenty of room to maneuver a large wheelchair or even a scooter around the room. 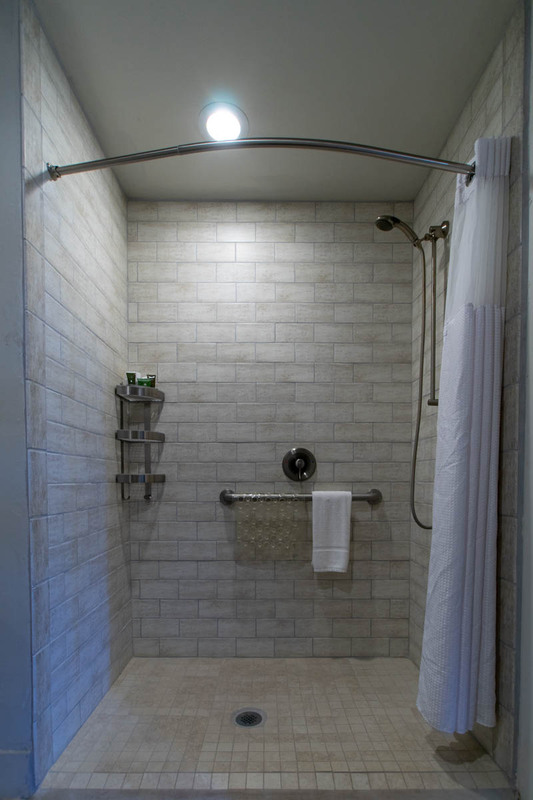 The bathroom is equipped with a roll-in shower with grab bars and a hand-held showerhead. 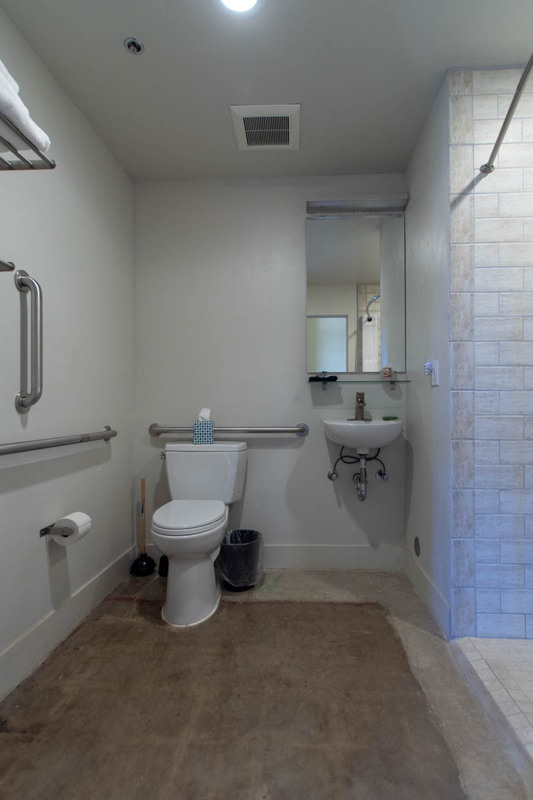 Other access features include a toilet with grab bars on the back and right walls (as seated), and a roll-under sink. 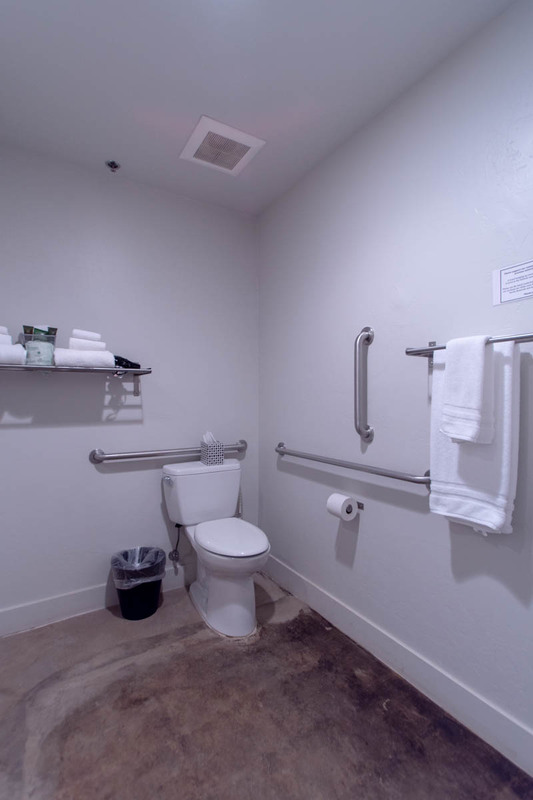 Additionally, a shower bench and a toilet riser are available for this – or any – room. Room 1110 has the same basic access features as room 1111, except that it’s furnished with two 22-inch high open-frame queen sized beds, and the toilet grab bars are located on the back and left walls (as seated). 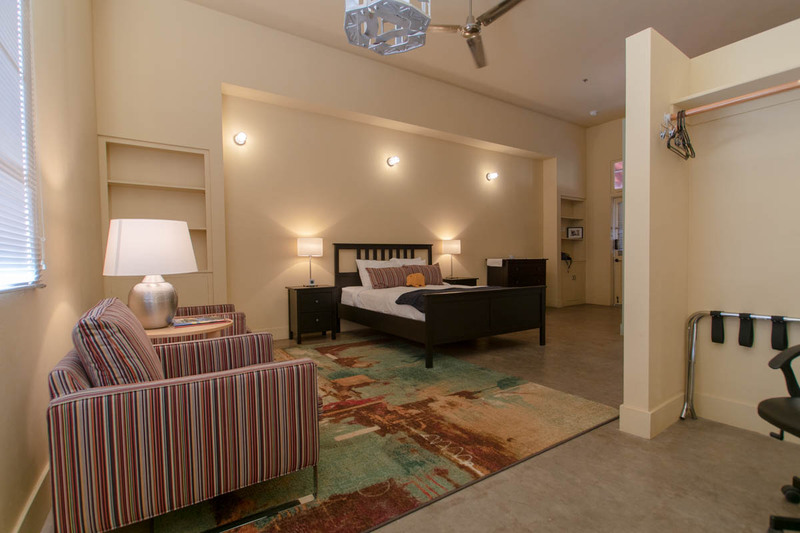 Room 1112 is furnished with two 22-inch high open-frame queen-sized beds with wheelchair access between them, a desk and a chair, and two easy chairs. 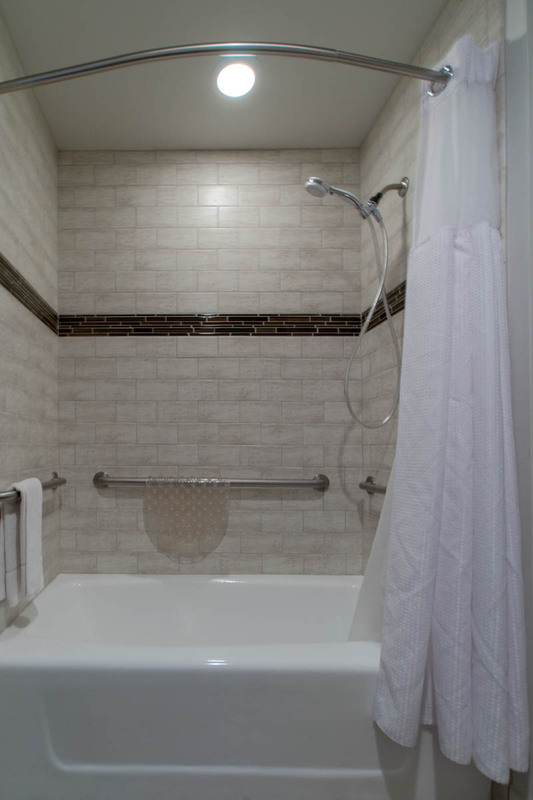 The bathroom features a tub/shower combination with grab bars and a hand-held showerhead; as well as a toilet with grab bars on the back and left walls (as seated), and a roll-under sink. Room 1113 is a mirror image of room 1112 and it has the same basic access features. 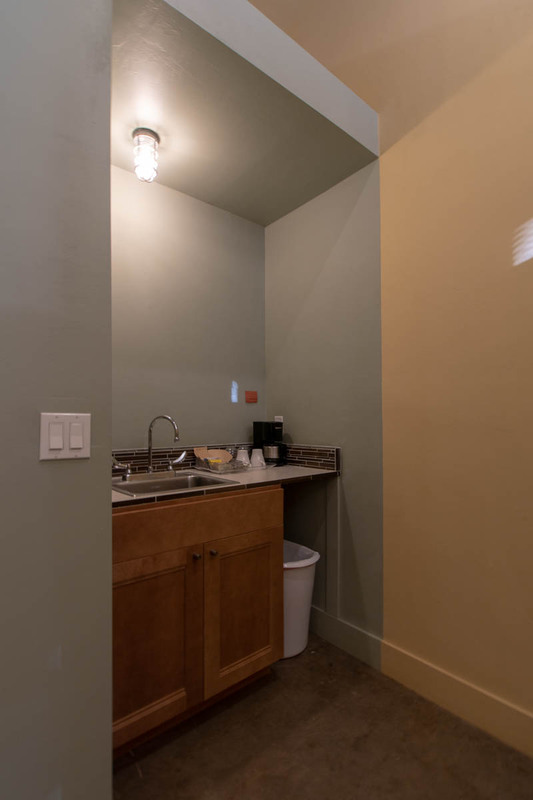 The toilet grab bars are located on the back and right walls (as seated); and the guest room is also equipped with a small kitchen with a sink, refrigerator, microwave and dishes. There are no televisions or electronic distractions in any of the rooms, but there is level access to a lounge which has a television and several sofas. There’s also a microwave and a refrigerator in this public area, just in case you’ve booked one of the guest rooms without these features. 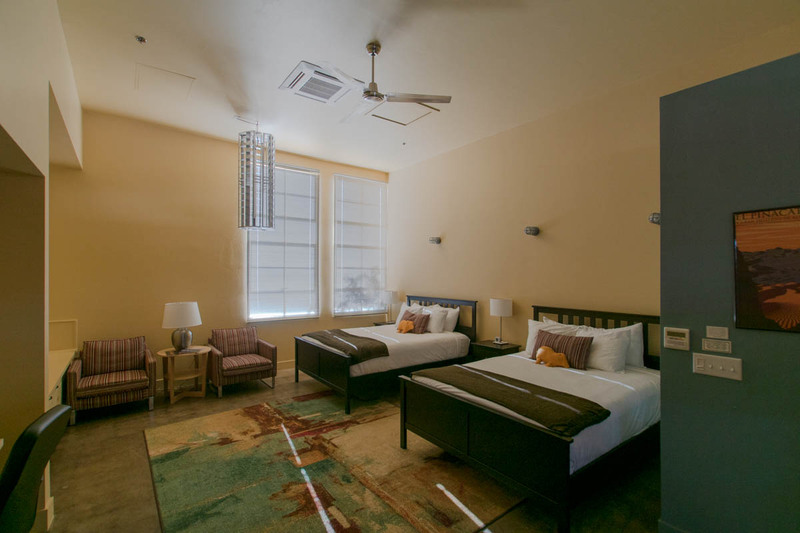 But one of the best features of the inn is the atmosphere – it’s a great place to enjoy the peace and quiet of the desert. And because of the lack of ambient light, it’s also the perfect spot to star gaze. Ajo is a peasant place to relax and unwind, but make sure and take some time to explore the town plaza. 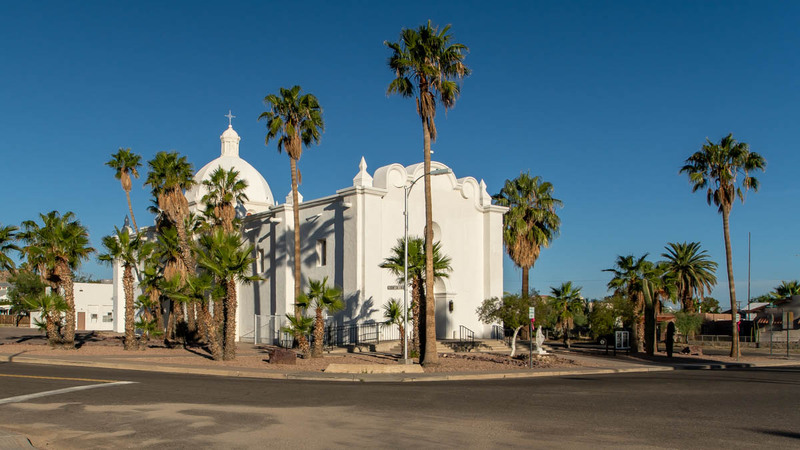 Although it’s located just a few blocks from the the Sonoran Desert Inn and Conference Center, some of the sidewalks are in poor repair, so it’s best for wheelchair-users and slow walkers to just drive over there. That said, Ajo Plaza was also renovated by ISDA, and as a result it’s nicely accessible. There’s plenty of accessible parking on both sides of the plaza, with curb cut access up to the well kept park area. As an added bonus, the plaza also offers a great view of the Immaculate Conception Catholic Church, which is located across the street. And if you’d like to do a little shopping, some of the shops surrounding the plaza offer level access. Don’t miss Artist’s Alley, which is located behind the library on the south side of the plaza. The result of a local street art project, and reminiscent of the murals in the San Francisco Mission District, the creations in Artist’s Alley range from whimsical to thought-provoking. While one mural depicts a spaceship and another includes a woman with flowers encircling her head, others espouse the virtues of humanitarian aid or invite folks to “lose yourself in the service of others”. It’s a colorful, eclectic and growing collection. And since there’s level access from the plaza, it’s an excellent option for wheelchair-users or slow walkers. Truly, it’s one of the cultural highlights of Ajo. While you’re in the area, take some time to explore Organ Pipe Cactus National Monument, which is just a short drive from Ajo.